Selected a long piece of chain from inventory and cut two pieces; one to 18" and one to 2". Attached clasps to the ends of the long chain. 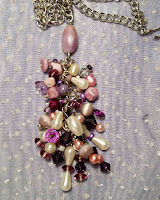 Put together a center bead piece and wired to both the long chain and the 2" piece. Using alot of jump rings, attached 24 of the bead sets put together the other night. Tried it on and wore it around for a short while. It's sturdy and lays very well. A winner; I like this piece .... definitely better here than the original Big Purple Heart.